The next phase in the Green Roofs Coalition master plan will continue this May with the opening of the second green roof at Eastview Collegiate. The demonstration plots should be implemented as soon as May 2, with the greening to be completed this June. "I am really looking forward to working on the Eastview demonstration plots," says Pearce, noting that only two to three inches of soil will be used. Similar studies will be conducted at this site, with research conducted on the reduction in temperature, stormwater run-off, etc. Toronto is not the only city that deserves attention in its initiatives to promote green roofs and more importantly, to squelch a potentially life-threatening problem. As Ligeti notes in her guest editorial in the Globe, the City of Chicago announced a new by-law that would see the inclusion of a green roof system on all new multi-use/story buildings in the city's core. Terry McGlade, of Gardens in the Sky and Flynn Canada, and the creator of the new rooftop garden at the Merchandise Lofts Building in Toronto, sees this move as a good step to environmental stewardship on the part of the politicians. "There's a political message here," he says. "The same movement that created the demand for natural plantings and the reduction in pesticides by municipalities is starting to come to the fore of the consciousness of our politicians. It's just natural (with all the environmental ramifications and benefits in air quality, lowered atmospheric temperatures and increase in oxygen) that the next step would be to go up on the roofs." McGlade knows of what he speaks. He's been designing and constructing similar rooftop gardens for commercial and residential clients through his Gardens in the Sky business, and has done so very successfully. The Merchandise Lofts Building is one of the latest in his landscape design portfolio, and it's different than previous "container" style rooftop gardens in that it uses the green roof infrastructure, with structural roofing support, thermal insulation, roofing membrane, filter cloth and growing medium with limited soil depth. The Merchandise Lofts Building, formerly the five-storey steel and concrete warehouse owned by Robert Simpson Co. Ltd., now houses a multitude of residential loft units, above-grade car and bicycle parking spaces, loading bays, food and retail stores, as well as office space, a major grocery store chain, a restaurant and indoor pool, party room and outside dipping pool. It also features two extensive green roof plots, showcasing a prairie meadow. The two plots measure approximately 10,000 sq. ft., surrounded by another 15,000 sq. ft. of hard surface concrete pavers. In addition to the immediate environmental impact, these rooftop gardens have many other less obvious advantages — including food production. 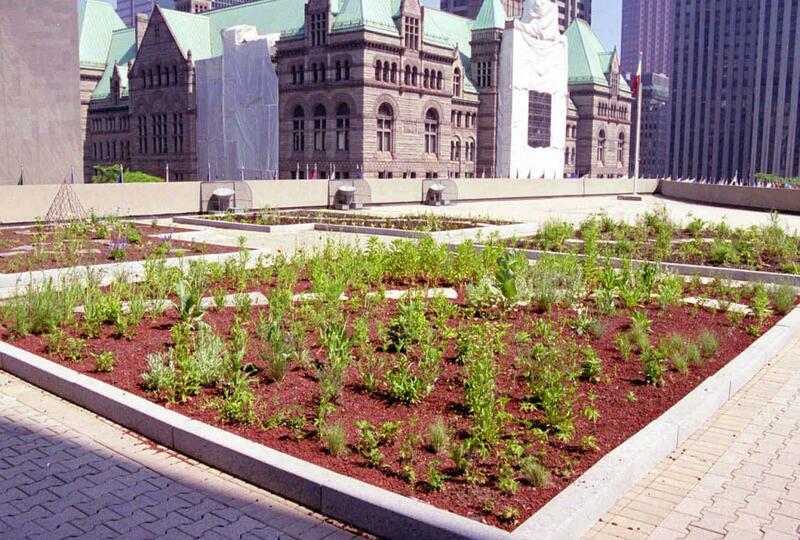 The City of Toronto took this step with the inclusion of its "urban agricultural" plot on the podium roof, donating crops to the Toronto Food Bank. In St. Petersburg, Russia, the main goal of its rooftop gardening initiative in 1993 was to examine rooftop gardening techniques, as well as producing greens and vegetables for urban people who have no access to land outside of the city. The techniques, developed by Dr. Martin Price of Education Concerns for Hunger Organization (ECHO) in the US, saw the possibility of producing 2,000 tons of vegetables. According to a web site produced by City Farmer, Canada's Office of Urban Agriculture, St. Petersburg has approximately 15 rooftop gardens, as well as two gardens in the largest prison in the city. These gardens, one at rooftop and one at ground level at the "Kresty" prison, help to feed 10,000 prisoners. Then there is the emotional benefit. With less and less space in people's homes and an increasing need to get back to the basics, urban gardeners (and some suburban ones) find they need to go further or be more creative in their gardening endeavours. The answer to some: rooftops, balconies and containerized gardening. For Vancouver, British Columbia's Waterfront Building, which combines a ground floor office, retail or service use with a mixture of commercial and "live/work" space, a green roof system was the perfect opportunity to create an aesthetically pleasing community recreational space. Open to the public, the Waterfront Building Green Roof was completed in the fall of 2001 and features both intensive and extensive garden plots. The extensive plots rely on Poa alpina and blue grass, while the intensive plots use more diverse plantings such as Rosa meidiland 'White'. For more information on either green roofs at Toronto's Merchandise Lofts Building or Vancouver's Waterfront Building, please visit the Canadian Mortgage and Housing Corporation web site at www.cmhc-schl.gc.ca. Also look to future issues of Landscape Trades for more in-depth articles on these two green roof systems.